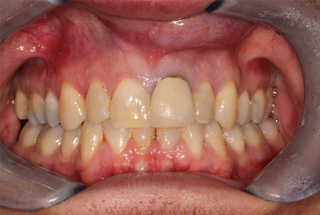 In many instances there is simply insufficient tooth substance to allow the direct placement of fillings or veneers to disguise cracked and discoloured teeth. 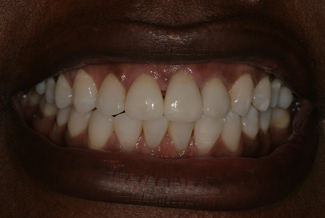 Crowning of such a tooth maybe the only viable option, to allow function and maintain premier aesthetics. 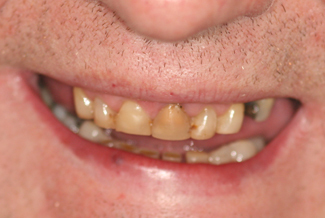 Crowns can hold together portions of a fractured tooth, support dental bridges to fill gaps created by missing teeth and provide longevity to heavily restored teeth after a dental crown procedure. 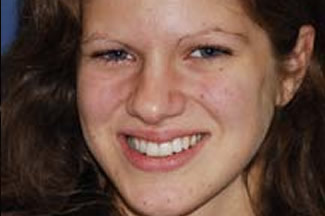 Some people refer to dental crowns as dental caps. Dental crowns are similar in shape to dental veneers except that crowns cover all the surfaces of a tooth whereas veneers only cover the visible outside surface of the tooth. See our portfolio. A crown is custom made precision item that is cemented over your tooth or implant to completely cover it. Traditionally crowns have been described as metal or ceramic fused to metal. However, advancing technology has provided materials based on Zirconium. These materials are very strong and durable thus eliminating the requirement for a metal substructure for your crown. 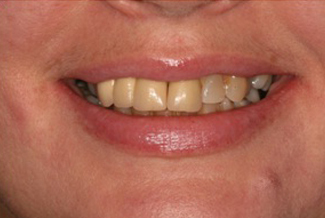 Ceramic crowns now are the gold standard in providing the ultimate aesthetic result. 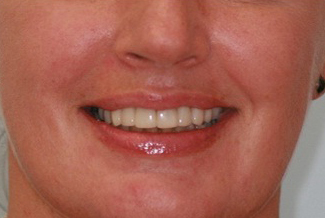 A Smile Cliniq crown addresses both aesthetic and functional needs. Initial consultation, assessment and planning will occur with one of our dentists. All options appropriate to your case will be thoroughly discussed. Preoperative pictures, radiographs and tooth shade maybe taken. In certain cases, particularly cosmetic cases, impressions maybe taken to allow our ceramist to provide a diagnostic wax up, this will physically allow you to visualise and approve the intended outcome of your tooth crown. 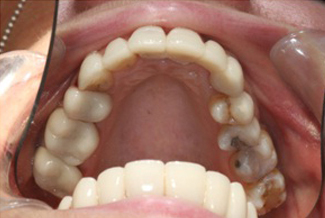 A sufficient amount of tooth substance and appropriate “core” must be in place prior to provision of a dental crown. 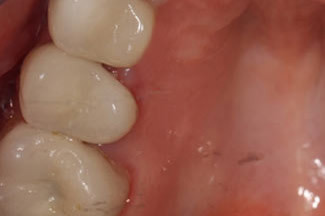 Once this has been established the process of crown preparation begins. At your second visit the tooth to be crowned will be prepared. 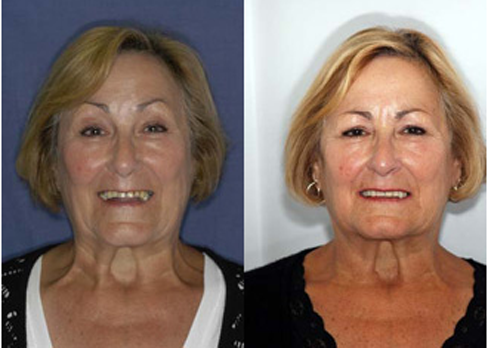 This occurs according to specifications required to provide a premier functional and aesthetic outcome. An impression will be taken of the tooth and sent to our ceramist along with your custom prescription for your dental caps. A temporary crown will be constructed, to provide you with an aesthetic, functional and protective provisional restoration. In the mean while our ceramist will follow your custom prescription to hand craft your tooth crown. The preparation procedure usually is a single visit of 60 minutes, however this maybe longer or involve multiple visits depending on extent, complexity and number of crowns. 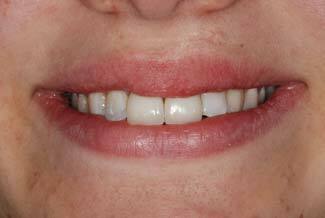 At your final visit the provisional crown is carefully removed and your custom made crown tried in. You will be shown the crown at this try in stage. 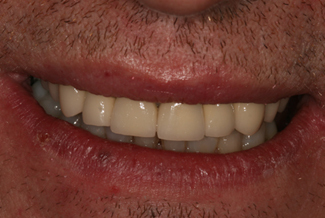 Once you confirm that you are pleased with the appearance and fit, your dentist will cement the crown to your tooth. 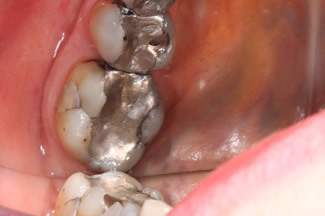 We expect our crowns to last for over 15 years and we provide a 5 year guarantee against crown breakage. It is generally accepted that between 1 in 5 and 1 in 8 teeth that have been crowned or have deep fillings in them go on to become non-vital and require a root canal treatment at some stage and this can be many many years after the initial crown. It may take a couple of days for you to become accustomed to your new crown. However, you will be invited to return a few weeks after the provision of your crown to review your oral health status, condition of crown and feed back of the cosmetic result. It is important to employ a strict oral hygiene regime encompassing professional hygiene intervention, as a crowned tooth is not protected from decay or gum disease. You will be shown the most appropriate method to ensure optimal oral health. As with any treatment regular recall and review is essential to ensure optimal status of your crown. Various types of dental crowns are offered at Smile Cliniq, and their cost depends on the material of choice, time taken, complexity of work and laboratory used. White, resin based material which chemically bonds to tooth enamel, thus less drilling is required in the dental crown procedure, but it is not as strong as all ceramic or metal crowns. The GC GRADIA family is a unique light-cured composite system for indirect restorations such as crowns, bridges, inlays and veneers and all types of direct restorations whether it’s in the anterior or the posterior region. White and incredibly aesthetic, often indistinguishable from natural teeth. Even stronger than Gradia and is also capable of chemically bonding to the tooth. Produces a very natural result. Ivoclar Vivadent’s patented lithium disilicate material is truly a revolution for the dental industry. Never before has a material been able to combine high strength, high aesthetics and ease of use into one product, until now. IPS e.max is a lithium disilicate glass ceramic that has optimized translucency, durability and strength for full anatomical restorations. Due to the use of new technologies and optimized processing parameters, IPS e.max lithium disilicate has evolved beyond previously available lithium disilicate ceramics. Indeed, compared to other glass-ceramics, e.max demonstrates a strength that is 2.5 to 3 times higher. IPS e.max lithium disilicate restorations exhibit superior durability featuring 360-400 MPa of flexural strength. When fabricated to full-contour, the monolithic structure is the most robust ceramic system tested to date. The opalescence, translucency and light diffusion properties of IPS e.max lithium disilicate were all designed to replicate natural tooth structure for beauty and undetectable restorations. White porcelain bonded to a metal sub-structure. The metal gives strength whilst the porcelain gives the white colour. Not as natural looking as emax and gradia crowns. 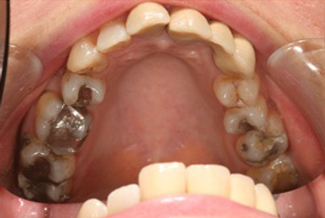 The metal substructure may be non – precious or precious metal depending on the patient’s choice. 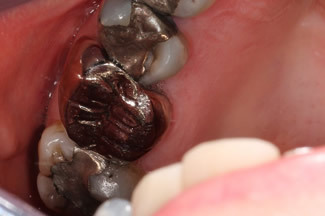 Precious metal is generally preferable as it is more biocompatible with the gingivae (gums) leading to less inflammation and is less prone to corrosion. The weak point here is the bond between the porcelain and metal, and over time the porcelain may break away from the metal. 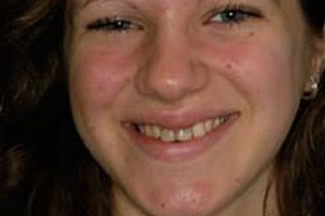 Also, as gums recede with age, a black line may be seen above the crown and this leads to an unsightly smile. This blackness is the metal in the crown. 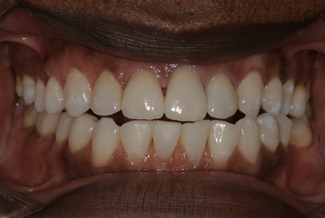 This does not occur with all porcelain/ceramic crowns. Metal dental crown. Very strong and durable. Has been a successful restoration for many decades. Has the most similar wear characteristics to natural tooth enamel and therefore is very effective on back teeth, especially in people who grind their teeth. The nature of gold as a material also allows minimal tooth preparation (as it can be formed in thicknesses of less than 1mm), thus preserving more tooth structure. When preparing a tooth for a crown, bridge or veneer, it is important to obtain an accurate impression so that the restoration fits perfectly to the tooth, giving ultimate aesthetics, durability and comfort. At Smile Cliniq we use high quality impression materials from leading manufacturers such as Heraeus Kulzer. The Flexitime impression material is released from a fast automated mixing machine known as the Dynamix. 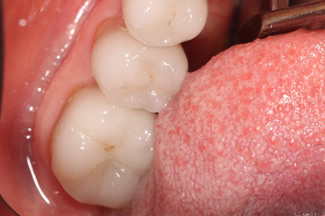 It’s precise dosage as well as thorough mixing of material limits the possibility of retaking the impressions, and therefore less chair time and hassle for the patient. Along with the Flexitime Dynamix, we use the provil novo light body silicone material to obtain even more accurate impressions that replicate the tooth structure to a fraction of a millimetre. Use of such high quality material, means a high quality crown, veneer or bridge can be made with a perfect fit. In certain cases (full stable occlusion) our dentists may use a novel impression tray called a triotray from a company called triodent. 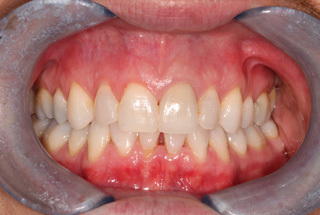 This tray allows impressions of both upper and lower teeth to be taken at once as well as recording the bite at the same time. 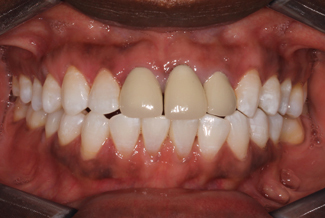 This reliable product allows a single impression to be used to construct the restoration instead of two separate impressions, and therefore reduces the number of times the patient has to have an impression taken. 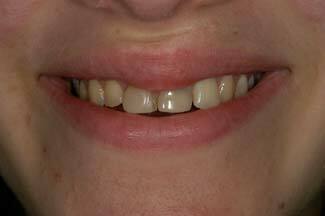 It also avoids the need for a full upper arch impression which some patients find initiates an unpleasant GAG reflex. The triotray being made of metal, is stronger and less flexible than plastic trays, hence improving the accuracy of the impression. 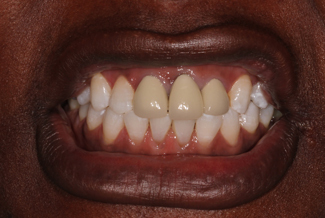 These are base metal crowns that contain less than 25% of metal or none. They often contain large percentages of nikel, colbat or chromium. These can be used when metal crowns are recommended and when the patient does not want to have a shiny metal as this material can be made matt.